within the disk's gap sweep up material that would have otherwise fallen onto the star. Credit: NASA/JPL-Caltech. For an explanation and a one minute animation, visit https://www.space.com/31146-alien-planet-formation-photographed.html and scroll down to the video or go to https://www.youtube.com/watch?v=lHcAA3DXNNE. Spanos Theatre, Wednesday, October 10, 7:00-8:30 p.m.
Kate Follette, an astronomy professor at Amherst College, will take the audience inside the discovery of planets outside of our solar system. Her exploration will include how, when and where planets form. Follette has traveled the world from Chile to Hawaii to observe planets in our galaxy using large, ground-based telescopes. She'll explain how astronomers can "de-twinkle" stars to make incredibly accurate observations, including detecting the infrared waves coming from newly formed planets. A question and answer session will follow the presentation. The presentation is sponsored with donations from Joan and Bob Field. Kate Follette is an astronomy professor at Amherst College in Amherst, Mass. She is a member of the Gemini Planet Imager Exoplanet Survey team, which announced the discovery of the Jupiter-like exoplanet 51 Eridani b in August 2015. The team focuses on pushing the limits of direct imaging of giant planets to solar-system scales. 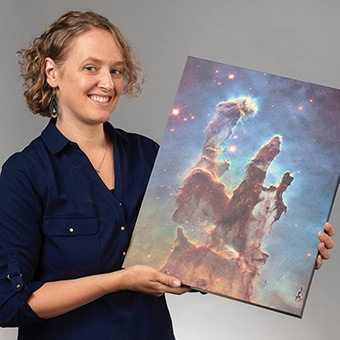 Follette was formerly a NASA Sagan Fellow at Stanford University, an NSF Graduate Research Fellow at the University of Arizona, and a Fulbright Fellow at Kyoto University. We are absolutely delighted that over 400 students, faculty, and community members attended our wonderful Cosmic Evolution Lecture on exoplanets on Wednesday night October 10 in Spanos Theatre by the highly talented Amherst College Astrophysics Professor Kate Follette. Her talk was entitled “How we find planets around other stars” She uses adaptive optics and image processing to de-twinkle stars so that she can directly observe light emitted from young giant planets. The ultimate goal as the technology advances is to image Earth-like exoplanets - in a tribute to Carl Sagan's pale blue dot, what she calls pale blue exodots. Unlike other exoplanet detection methods like observing transits, direct imaging has the potential to investigate the composition of an exoplanet's atmosphere. 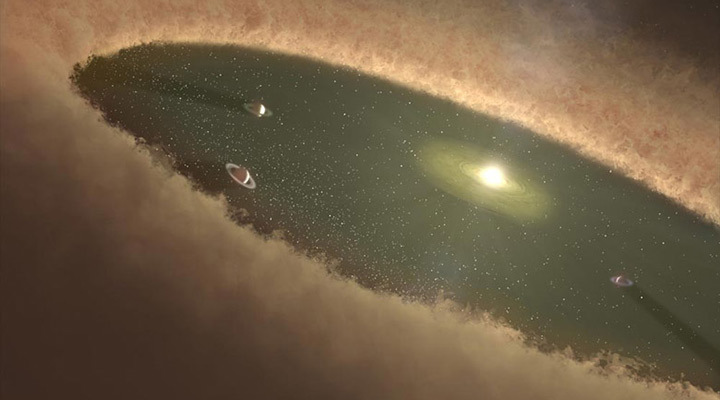 It is believed that a methane atmosphere is typical of a gas giant, carbon dioxide may be a lifeless rocky planet, and non-equilibrium gases like ozone, water, and oxygen suggest a rocky planet that is geologically active and may have the building blocks of life and may in fact be alive - possibly on its way to evolving intelligent life. We want to thank everyone who made this event possible and who promoted attendance at it.